The FireFly is ready for action! Origami Bicycle Company is small company with a loyal following. We have been offering a range of folding bicycles for about 7 years now, and it is time to embrace the e-bike market. The FireFly is actually an evolution of Dragon model, so much of the handling dynamics and ride feel are carried over. 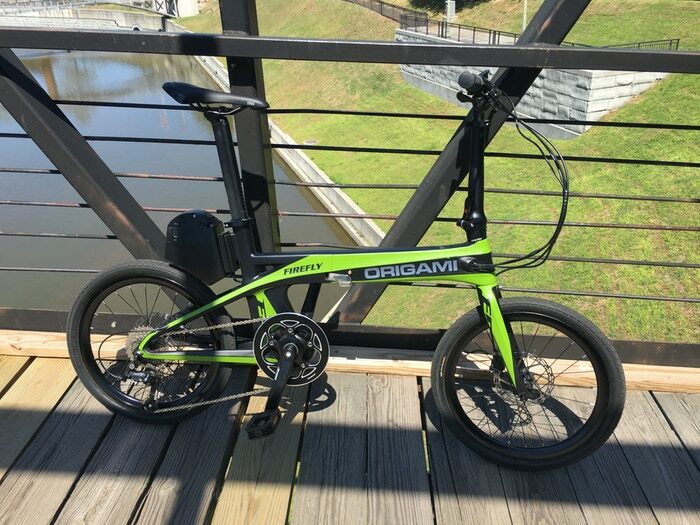 We want to offer the world something that is pretty hard to come by, a folding e-bike with a long range (35 miles), light weight, fantastic riding dynamics, beauty, and quality, all at a reasonable cost. I think that we have achieved all of these goals with the FireFly. The FireFly is an e-assist bike, so power flows to the motor only when the rider is applying some force to the pedals; this allows us to avoid classifying it as a moped no mater the speeds you achieve. Yes, we thought of everything. The fact, that power flows to the cranks only when the rider is pedaling, gives the rider a sense that all of his/her effort is being directly amplified….because it is! One is not just “along for the ride” as the with a hub motor, but one’s efforts are linearly boosted for a superhuman feel. All components of the FireFly are from world-class manufacturers, like the proven SHIMANO speed and brake system, the reliable TOTAY T800 Carbon Fiber frame and the powerful Samsung battery. The world of e-bikes is still much like the Wild West. There is not standard voltage, no standard approach, just lots and lots of options. This is both good and bad; we have plenty of avenues for creativity, but some parts and pieces are not yet standardized. We looked at several approaches. Our first prototype used an aluminum frame and a hub-motor. Hub-motors are essentially a drive motor placed in the hub of either the front our rear wheel, we chose the rear. The downside to hub motors is that they simply drive the wheel directly so you loose the relationship between the rider’s input and the performance of the bike. Additionally, hub-motors tend to be heavy and relatively inefficient. That first prototype worked well, but was heavy and not very engaging for the rider. The choice of a mid-drive motor was the obvious choice. Since the mid-drive configuration allows the motor to drive the crank wheel (chain ring) directly, the rider still has access to all 9 gear ratios and can use the extra oomph from the motor to better climb hills, go fast, or just cruise with minimal effort. We considered some of the commercially-available mid-drives, but they all seemed heavy and unsophisticated, so a custom configuration was in order. We have utilized a compact and efficient 250W motor that is integral to the bottom bracket for the lightest and most compact packaging. We also decided to modify our Dragon’s carbon fiber frame to easily accept the motor while keeping overall weight to a minimum. Now, we have a fantastic product with the ride characteristics of our Dragon married to the convenience of on-demand power. The biggest hurdle is the reason that we are here on Kickstarter today; we need the funding to bring this bike to market and change the way people think about bicycles, bicycle commuting, and folding bikes. We hope that you will help, and we hope that you will enjoy the freedom that comes with our FireFly folding e-bike.